So I’ve had a bit of a problem. 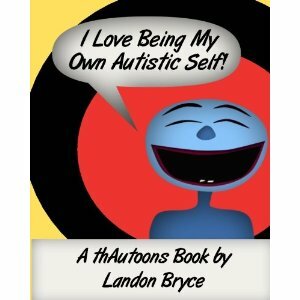 You see, my friend, Landon Bryce, the author of ThAutcast and its wildly popular accompanying Facebook page, wrote a little book. I call it ‘little’ only because it’s short – and a very quick read. But believe me when I tell you, that it’s actually huge. Like really, really HUGE. And he’d asked if I might be willing to take a peek at it. Perhaps, if I were so inclined, offer up a quote that he might use to help market it. And that was where my problem started. And well, that’s not really a useful quote. So I read it again. And then again. (Because at thirty-eight pages long and mostly cartoons it takes about as long to read as this post.) And after reading it again, I came up with another quote. So I promised to try to come up with an actual quote. Ya know, one without the F word in it. Because I believe in this tiny but HUGE book that he’s written. Because I believe that it is NECESSARY. That it should be REQUIRED READING for anyone who loves someone autistic. Or knows someone autistic. Or knows someone who once met someone who had a third cousin they were pretty sure was autistic. It’s that important. Because this tiny but HUGE book is a game-changer. 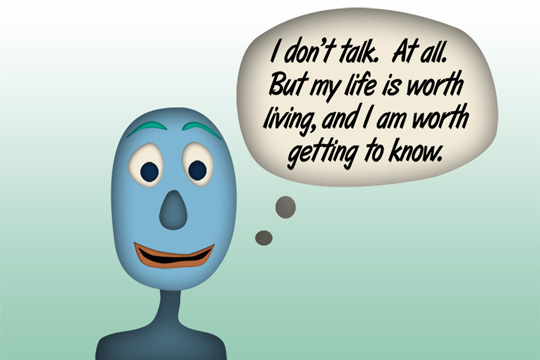 Because in thirty-eight pages, Landon’s cartoon characters bring autism to life. They help those of us on the outside understand just a little bit more of what is happening on the inside. And through their short, masterfully designed interactions with one another, they deftly explore the varied perspectives within the autism community (and their subsequent overlaps and clashes) FROM THE INSIDE OUT. In just thirty-eight pages, Landon explores such thorny and messy issues as difference vs disability, cure vs support, acceptance vs the need to fix, empathy, self-advocacy, relationships, self-love. At its core, the book, for me at least, is really about that last one — self-love. It’s about self-acceptance and self-esteem and self-worth. And using that as both its starting and ending points, it’s also about our ability, both as individuals and as a society, to affect the self-image of autistics with our words, our actions, our attitude toward them AND their autism. And the inability to separate the two. So if you love someone autistic or know someone autistic, or once met someone who had a third cousin they were pretty sure was autistic, buy the book. Buy it for your kid. Buy it for your spouse. Buy it for anyone and everyone who works with our kids – teachers, therapists, psychologists, school librarians, EVERYONE. Hell, buy it for your book club. Thirty-eight pages will give you plenty of fodder for conversation, I assure you. Just buy it. Read it. Think about it. Talk about it. Let it in. For autistic adults like Landon. For my daughters. For yours. For you. Thank you, Landon. The world needed this. It sounds like an amazing book and I will be buying it for sure! Totally buying this for my husband. And perhaps my son’s teachers. And maybe his therapist. Thank you Jess for sharing this and thank you Landon for writing this. Perhaps finally a book about autism that won’t just sit on the shelf. I see huge book sales in Landon’s near future! This is wonderful and sounds like a good book to add to my son’s library as we start to discuss his autism. I just sent it to my Kindle! Thank you for sharing! Just bought three online. One for my Bigs, one for the techer and one for the school system’s parent mentor. Thanks, DOAM!! Just bought it. Looking forward to reading it with my daughter. What did we ever do before Amazon? And I think “f%$&!ing amazing” is a great endorsement but I’m known for my colorful language. Great endorsement…. Thanks for sharing. AND, my bestie bought the book to help her daughter understand my daughter. KUDOS to you!!! Looks wonderful, can’t wait to share. I like the paragraph that begins with, “In just 38 pages…..” as a usable quote. Though I like the others too! I loved the book. It made me realize something that I don’t think is talked about very much. And that is how to live with competing needs. For my son, when we are having a conversation, he can have his whole body turned away from me, and still be listening. But that can make me ‘sea sick’. His non-verbal language is screaming at me that he wants me to go away and isn’t interested in what I’m saying. His verbal language is telling me he is interested. But if I’m tired, it is so much work ignoring the non-verbal signals that I can’t do it. If he’s not too tired we compromise by him giving appropriate non-verbal cues – he turns around and faces me. If we’re both too tired, we can’t have a conversation then. If I’m not tired, I just ignore it. Suppressing my reaction to some of my son’s stims is as much work for me as it is for him to suppress his stims. For me, there has to be an acknowledgement that the discomfort works both ways. My sons droning hum can drive me berserk! I have to work really hard at ignoring it. He has to work really hard at suppressing it. Sometimes we have to be at opposite ends of the house so he can hum away and I don’t hear it! Sometimes he needs to stop humming. Sometimes I need to just ignore the hum. The conversation just feels so one-sided so often – either an NT person being unreasonable and unsympathetic, or the autistic person being ‘clueless’ or ‘wrong’. But there are two people involved. Both with needs. Both making an effort. Both with equal right to having their effort acknowledged. I’m happy you’re supporting Landon’s book, I also think it’s f&$@ng amazing and it deserves to be read by everyone interested in autism. I’m asking my local library to stock it up as well. After reading your blog I get the impression that you did find the words and although none of them started with the “F” word, they all were quite eloquent. I get it and I think you should include it as an insert to parents in each copy of the book. Bought it. Thanks, Jess, and thanks, Landon! Well, I’m the only one here, so I suppose that would be me. ;) You’re always welcome to share a link to your Facebook page either here or on the Diary Facebook page. There’s no way to share images directly other than via a link. I can’t share an image directly from your blog to my page.. I would need to download and upload, no? Apologies, I misunderstood what you were asking. While you are welcome to share via the link or by hitting the share button, you may not cut and paste images from the blog without copyright infringement. If it’s a graphic that I’ve created, it’s likely on the FB page. ;). oh! If it’s you, I’ll def share from your page but it seemed like it was a comic from a book? I know LOL, that’s why I asked if you know who I need to ask, I’ll look it up again. Oh, it’s the pic in THIS post, above! lol! sorry – total misread on my part. lemme look.